Rescue the Pets in This Addictive Puzzle Adventure! Good variety of levels to keep you on your toes. Has a gentle learning curve. Annoying pay walls and wait times can disrupt the pacing. Experience the puzzle fun of Pet Rescue Saga! This whimsical game takes place in a magical kingdom populated by animals, but evil Pet Catchers are trying to destroy the peace by making off with the kingdom’s citizens. Only a hero with awesome puzzle skills can save the day. Are you up for the challenge? 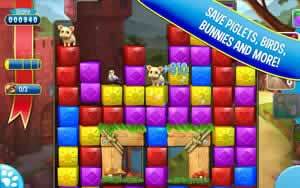 The puzzles in Pet Rescue Saga consist of colorful blocks arranged in stacks. Tapping two or more blocks of the same color will make them disappear, and the rest of the blocks on the board will fall down to fill the now empty space. The more blocks cleared in one move, the higher the point value of the play. As the animals flee from the Pet Catchers, they sometimes find themselves trapped on these large stacks of blocks. In the levels with stranded pets, it’s your job to save them by matching the blocks underneath in order to bring the animals safely to the ground. In other levels, you simply match blocks until you pass a certain percentage or score. At the end of each level, the game gives you a rank between one and three stars. If you’re looking to challenge yourself, aim for three stars on each level. These puzzles are easy to learn yet difficult to master. Every move changes the board, and predicting the impact of each play takes some serious skill. 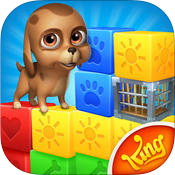 Pet Rescue Saga boasts 147 levels of block-busting action guaranteed to keep players busy for hours. In real life, goals provide direction in complex situations. The same can be said for Pet Rescue Saga. This game is a series of adventures that revolve around the needs of animals in the story world. These goals and targets keep the game interesting, level after level, while also adding extra challenge to this otherwise straightforward puzzler. There are cool power-ups like rockets, hammers and color popping balloons that make it easier to rack up the points in this game. Pet Rescue Saga gives players a few to try for free, and then the power-ups are available in the shop for purchase. These power-ups are helpful, but are by no means necessary. You are free to spend as much or as little as you like on this game. It’s totally up to you! The graphics in this game are bright, colorful and fun, making the puzzles really come to life in the palm of your hand. The background music is also well suited to the game, setting the stage for an enjoyable gameplay experience, every time. This game is meant to be played with friends. Go head-to-head with your buddies by connecting the game to Facebook! You can view the standings on the leaderboards and pit yourself against the high scores of your friends. You can also enlist the help of your pals by asking for lives. Just make sure to return the favor when the time comes! Pet Rescue Saga successfully pairs fantastic puzzles with adorable animals to create a unique experience that’s memorable and engaging. If you’re a fan of puzzle games, be sure to give this game a try! Matching puzzle games are a dime-a-dozen these days, especially in the world of mobile gaming. While a lot of developers are smart enough to add one little unique twist to the mix, they are all still the same basic game at heart. In this regard, the cutesy menagerie-themed Pet Rescue Saga doesn’t exactly stand out too much. On the plus side, it handles things with a lot more polish and friendliness. 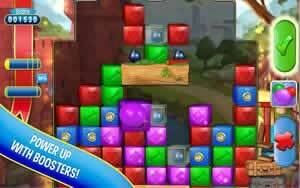 The puzzles are in general more challenging and varied than Bejeweled, but the difficulty curve is much smoother than Candy Crush Saga. Therefore, it can’t be faulted too much for being a cliché, especially since you can play it for free if you deal your cards right. The presentation of Pet Rescue Saga is pretty decent overall. While the visuals may not be the most technically-impressive or mind-boggling things out there, they accomplish what they set out to do. The colors are bright, and each of the blocks has a distinct appearance to ensure you don’t mix any of them up. More impressively, every puzzle is solved against a lovely background that changes every few levels. Nothing about the game looks bland. The animals that you set out to rescue are well-rendered and decently-animated. They’ll sniff the air, glance nervously around at their surroundings, and look at you with pleading puppy dog eyes. It might seem a little saccharine to some people, but the animals do look adorably helpless. There’s a good variety of them too; you’ll rescue piglets, puppies, birds and hedgehogs, among other critters. They're all very unique-looking, have a good amount of personality infused into their little sprites, and you might feel nice for rescuing them from the evil Pet Snatchers. The basic idea behind Pet Rescue Saga is simple. You need to group assorted stacks of blocks together into matching sets before getting rid of them. However, this isn’t a game that’s about swapping blocks around to form groups; it’s about controlling the falls of the existing blocks as you clear out the matching ones. In this way, a good deal of spatial awareness is needed if you want to get anywhere. It sounds easy on paper, but these games are always designed to throw curveballs at you to make things even more interesting. For instance, this game does not shy away from obstacles. Some blocks are boarded up and can’t just be destroyed with a simple finger tap, so they mess up the way blocks can fall. There are locked boxes that will impede falling blocks until a key is dropped right onto them. Some levels will attempt to mess you up by raising the columns every turn. Overall, there’s a healthy variety of mechanics available that will make sure you change your strategy regularly. If those obstacles are giving you grief, then Pet Rescue Saga includes a variety of power-ups called boosters that might provide some help. The hammer-like Block Buster lets you take out a single block of your choosing, which can be useful to form bigger groups of matching blocks. The Column Blaster and Line Blaster do what their names say they do: destroy an entire column or row of blocks respectively. The Mish Masher removes any cages from the field. There are a few more to be found, but not many. Pet Rescue Saga could have afforded to bring in a lot more boosters. The current ones feel pretty basic and none of them really fit the game’s animal rescue theme, but they do the job and come in handy when you get in a jam. What's most impressive about Pet Rescue Saga is that it knows when to mix things up. Not only does it progressively add more features and obstacles, but it's also smart enough to change the goals for each level. One level will simply ask you to remove a minimum number of blocks from the screen. Another will require you to rescue all of the pets by bringing them down to the bottom. Overall, Pet Rescue Saga stays fresh for decent lengths of time despite the simplicity of its gameplay. If you are still reeling from the demonic level of difficulty from Candy Crush Saga's most notorious levels, or have at least heard the horror stories, then there is some good news to be found. Pet Rescue Saga seems to have a much more consistent learning curve. While it will certainly vary from player to player, there are far fewer "brick wall" levels to find here. The challenge of Pet Rescue Saga tends to climb at a steadier pace than Candy Crush Saga, ensuring that you get eased into the game and what it expects of you. You won't feel like you've been thrown to the wolves nearly as often. Pet Rescue Saga is yet another one of the many freemium games that are saturating the mobile market right now. The good news is that that the business model it relies on isn't as cluttered as other games can be. The bad news is that it still has its fair share of annoyances. The most notable of these issues is the way your progress is limited. Pet Rescue Saga doesn't use an energy meter like a lot of games do, but instead uses lives. This is a welcome change, as it means you can easily play the game for however long you like, provided you play well and don't lose lives too often. This is good, but it also means that if you're not so skillful, have a run of bad luck, or ending up hitting a brick wall, then you'll only play for a short period of time. This can make learning the ropes potentially much harder for less skillful gamers. The only way to get extra lives is to wait for them to regenerate automatically, buy them with real money, or get them from friends. Better hope you have a lot of friends who play Pet Rescue Saga. You might need them if you're cheap and impatient. Luckily, when you get down to it, it probably isn't going to be that big of a deal. While the pacing of Pet Rescue Saga is sure to have its ups and downs, it works best in short bursts of time like most mobile games. If you can manage that, as well as use your boosters wisely, then you can easily play the whole game and enjoy all it has to offer without paying a cent. On one hand, there's not a whole lot in Pet Rescue Saga that helps it stand out from the crowd. If you're burned out from playing too many matching puzzle games, this one isn't going to revitalize the genre for you anytime soon. On the other, it's still pretty competent at what it does. The puzzles are varied, the difficulty level is fair, the challenge ramps up at a gradual pace, and it can still be good fun to play. Give it a whirl if you feel so inclined; it deserves that much at least.